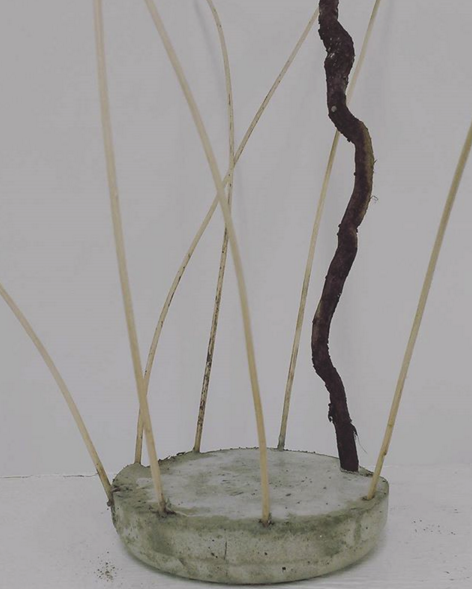 This workshop covered expressive ways to create nonfunctional sculptural works using organic, found, and recycled materials with basketry. 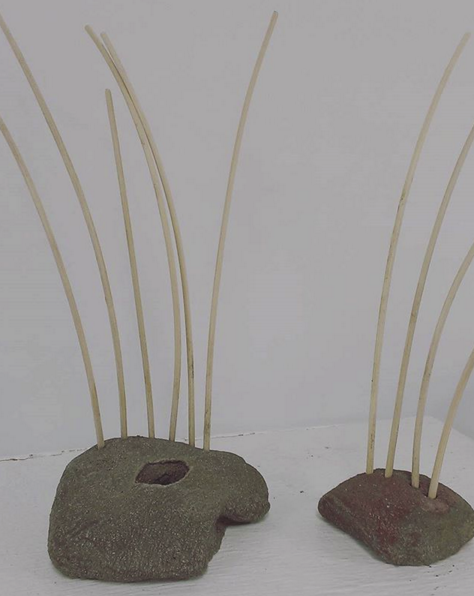 Students first learned basic twining techniques using wax linen and hemp twine. Then they began working intuitively with chosen objects while considering the techniques they learned. 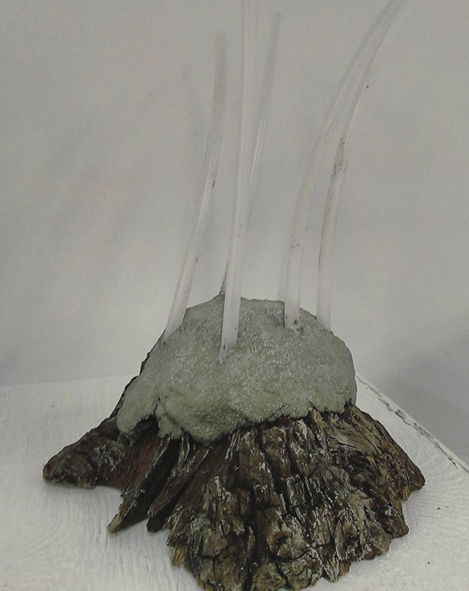 Materials included clay, cement, waxed linen, reed, wire, and any found objects students brought with them. Each student completed three different basket samples and began one large basket project in class (and finished the work at home). 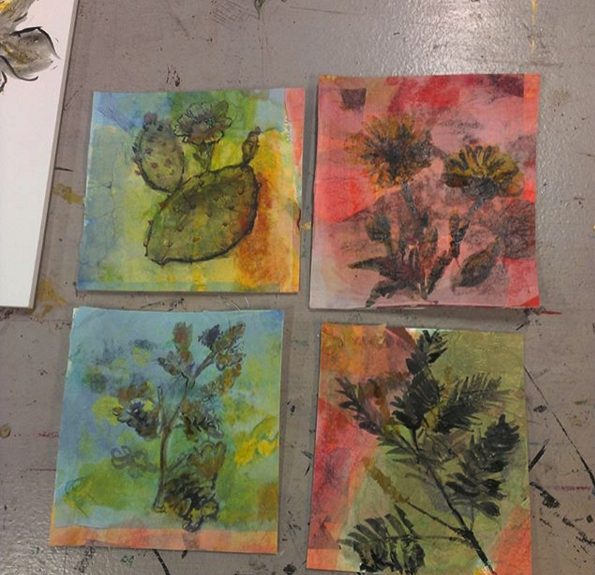 During this workshop, studets explored the use of natural dye inks and flower stamping techniques on paper. Students learned how to mix their own inks from natural plant materials such as logwood, cochineal, marigold flowers, and cutch with gum arabic and alum. All participants learned the basics of natural dyes, how to extract color, what are mordants, and how to use them to alter hues with additives such as iron, and citric acid. Participants explored the ancient tradition of Shibori dying. Shibori is a Japanese term for several methods of dyeing cloth with a pattern by binding, stitching, folding, twisting, compressing, or capping. Students focused on obtaining beautiful blues on cotton and silk using indigo. We covered how to make three different organic indigo vats from scratch using fructose, henna, and iron as reduction agents. 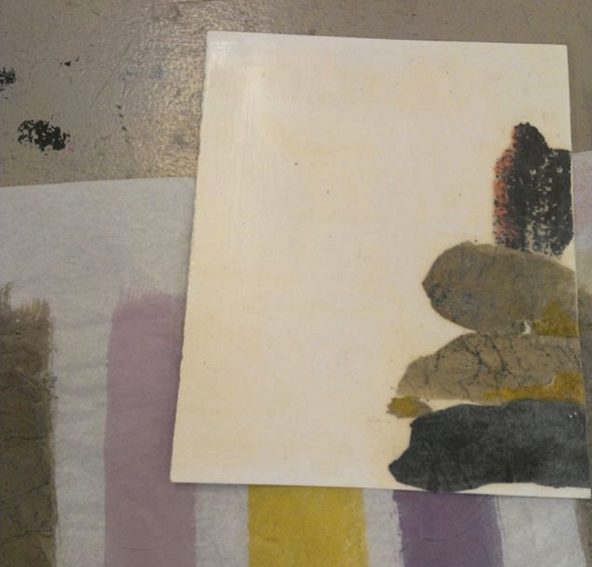 In this workshop participants explored how to embellish paper and fabric with swirls of color. Marbling is an ancient technique practiced in 12th century Japan and in 15th century Turkey. 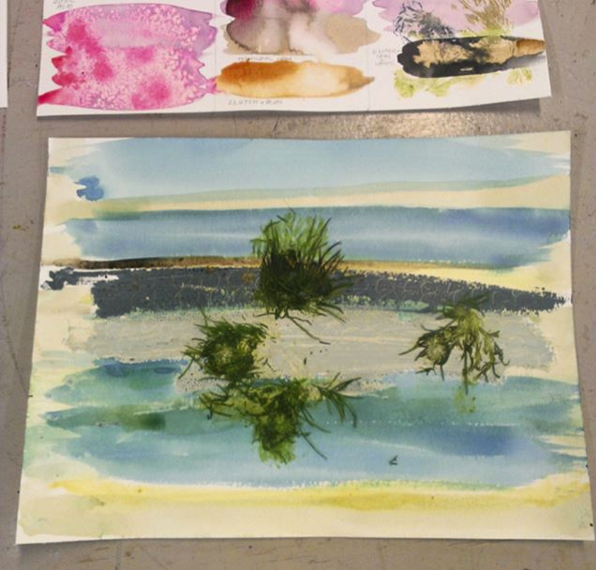 Delicate paint patterns are floated on a gel-like bath and transferred to a watercolor paper, cotton and silk surfaces. 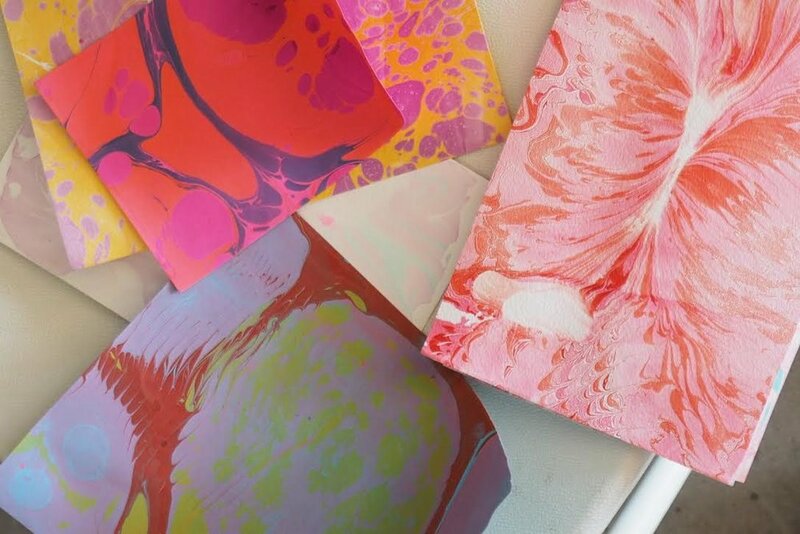 Students considered how marbling can be used to enhance an artist practice in fibers, collage, illustration, or printmaking. 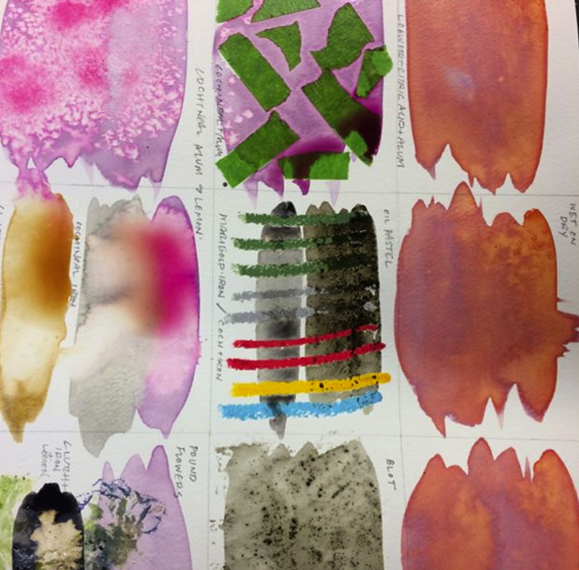 On day one, we focused on the chemistry of the alum mordant and carrageenan size and how to apply marbling designs to paper. Day two focused on applying marbling designs to fabric samples and a larger fabric piece. Students went home with 12 sheets of marbled paper, cotton and silk samples, and a finished, 22"x 22" cotton bandana.